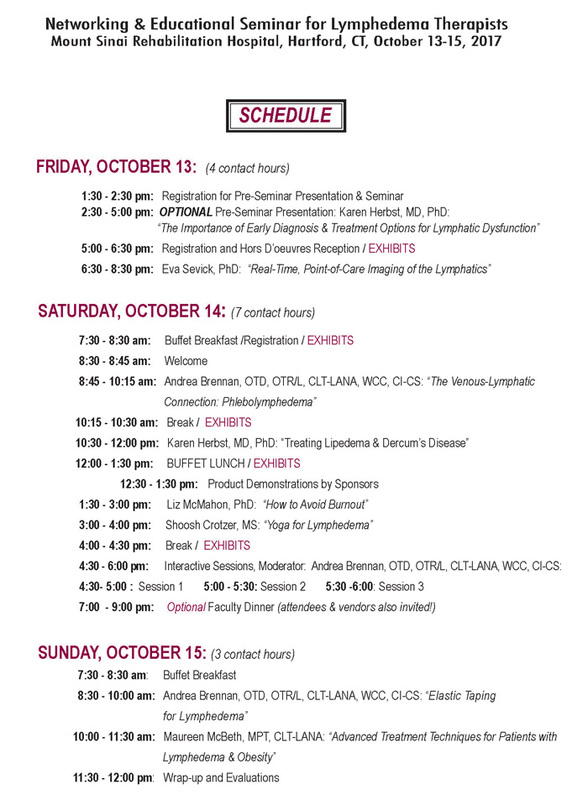 "The Importance of Early Diagnosis & Treatment Options for Lymphatic Dysfunction"
Call for Reservations and ask for the discounted Lymph Seminar rate of only $95/night! This hotel is 6 miles from the hospital (15 minutes by car) and 5 miles from the Hartford Bradley International Airport (BDL). Andrea Brennan, OTD, OTR/L, CLT-LANA, WCC, CI-CS: "The Venous-Lymphatic Connection: Phlebolymphedema" and "Elastic Taping for Lymphedema"
Karen Herbst, MD, PhD: "Treating Lipedema & Dercum's Disease"
Liz McMahon, PhD: "How to Avoid Burnout"
Maureen McBeth, MPT, CLT-LANA: "Advanced Treatment Techniques for Patients with Lymphedema & Obesity"
Lymphedema Seminars is an Approved Provider #8208 for Continuing Education by the American Occupational Therapy Association (AOTA). We have also been approved for CEUs for PTs in Connecticut from CPAPTA (#CT 17-8-04) and will provide Certificates of Completion to all attendees.